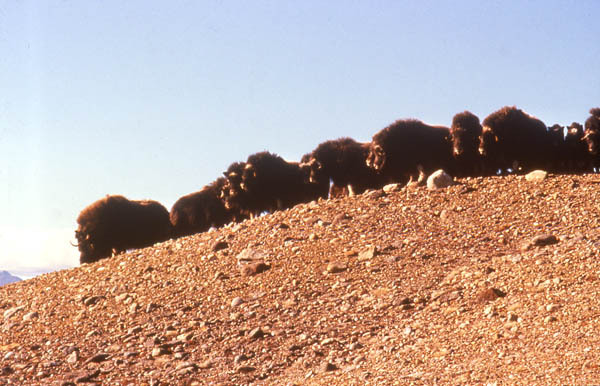 A Muskox group stands in a defensive formation at the threat of danger. They stand shoulder to shoulder, their sharp horned heads turned toward the adversary. The defensive circle is a perfect protection against their main natural enemy, the wolf. When confronted by rifles, this kind of defence was suicidal and entire herds were gunned down. It has been said that more people get injured by Muskox than by polar bears. One reason might be the animal appears clumsy and docile and therefore less dangerous. Whereas the polar bear, known to be aggressive, receives a higher degree of respect.